Prey on the pins with the Motive Golden Jackal. 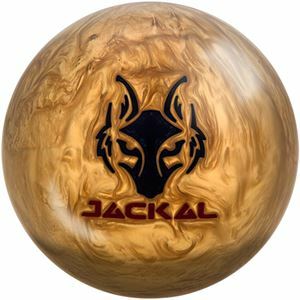 The Jackal is back and this time, Motiv has gone to new lengths with this ball. The Hexion SE pearl reactive cover finished at 4000 Grit LSS is not only eye-catching on the lanes but also produces incredible downlane motion while still digging into heavy oil with ease. Inside, you will find the brand new Predator V3 asymmetric core with low RG, making it very forgiving and perfect for giving you the hooking power you crave on heavy lanes. Attack the pins like never before.